After a periodic check of my broker account I noticed that the annual dividend from Nestlé stock had popped up in the April income column. For those reading in America you guys are lucky enough to get your dividends on a quarterly basis, often courtesy of holding a selection of the highest quality companies of all time. Here in Europe dividends are typically paid either twice a year – the majority of cases in the UK – or with just a single annual payment, which is more common with stocks on the continent. I guess a lot of US income investors might see that as a drawback. I mentioned in a previous piece on L’Oréal that one of the other perceived downsides to holding foreign listed stocks comes from dividend withholding taxes. Leaving aside some of the mitigating factors (such as taking advantage of taxation treaties, or claiming withholding taxes against your own domestic taxes) there are some stocks that are just so high quality that they are worth taking a look at. L’Oréal is one of them, as is Swiss food giant Nestlé. The only reason Nestlé has less slightly less visibility than comparable blue chip giants like Procter & Gamble and Unilever is that it has a primary listing in Switzerland, rather than in New York or London. All of them have huge durable competitive advantages from their branding and operational scale. Their products are just so diverse, across all geographies, that it’s almost impossible to imagine a scenario in which they aren’t around in forty or fifty years time paying out their quarterly (or annual) dividend. In the case of Nestlé you have a range of internationally known brands that spans from coffee to chocolate, water to ice-cream, and includes powerhouses like Nescafé, Nestea, KitKat, Wonka and Vittel. As an aside they also own 23% of L’Oréal as well, giving Nestlé shareholders an indirect slice of the cash flows from high quality beauty brands like Maybelline, Vichy and Garnier. The result is that Nestlé is in a position to return huge amounts of its cash flow to shareholders every year without harming the future profitability of the company. It’s among the bluest of blue chip stocks. You throw in some modest organic growth plus the long-term effect of stock buybacks and you have the core components of a dividend portfolio, whereby the only thing an investor ever has to worry about is making sure they don’t overpay to own the underlying profits. That’s really the crux of investments in the consumer giants; they’re steady wealth builders when bought at reasonable valuations due to the unbelievable consistency, high quality and sustainability of their profits. They not going to make you rich in a hurry, but they’ll quietly go about their business whilst throwing off buckets of cash in the background. 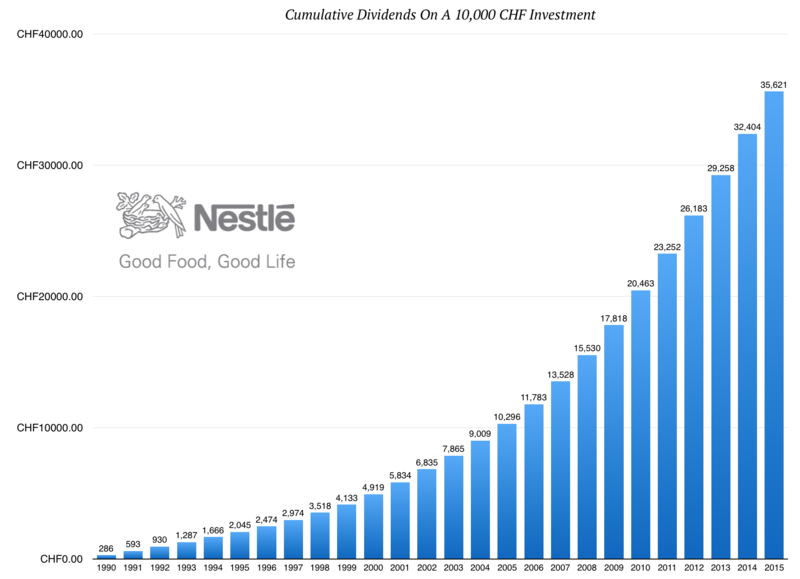 Imagine an investor purchasing Nestlé shares in 1990, the year that I was born. At the end of that year the shares were trading for just under 7 CHF each, with a full year dividend per share for 1990 of 0.20 CHF giving them a 2.85% yield. A nominal 10,000 CHF investment, which in 1990 would have been the equivalent of about $15,000, would have picked up 1,430 shares for our investor along with a 1990 dividend payment of 286 CHF (roughly $190 back then). And over the following twenty-five years cumulative dividend payments total 35,620 CHF. In addition to the small fortune that would have been amassed in cash dividends, the initial 7 CHF shares in 1990 are today worth 72 CHF each – helped by the boost to capital returns provided by an expanding valuation multiple. This first scenario, which is assuming no dividend reinvestment, would have returned our investor 11% on an annual compounded basis. The second scenario, which assumes all of the dividends were reinvested during the period, would have delivered returns of 12% compounded per year. That’s turning the initial 10,000 CHF capital outlay into roughly 165,000 CFH worth of Nestlé stock today. At today’s dividend yield of about 3.1% that would have thrown off approximately 5,100 CHF in annual income, ready to be put back in to buying more stock, to fund another new share purchase or simply cash flow to use for personal reasons. It’s a perfect example of how one good investing decision can build a relatively large amount of wealth and future cash flow, all for doing no more than buying into some of the world’s strongest brands in an incredibly reliable and stable operating sector.